When was the first gold rush in the USA? If your answer is 1848 at Sutter's Mill in California, you are late by almost fifty years. The first substantial gold strike was in Cabarrus County, North Carolina in 1799, just outside the Uwharrie Mountains. This summer, fans of all-on-foot hidden transmitter hunting will "rush" to North Carolina forests of oak and pine for USA's national championships of Amateur Radio Direction Finding (ARDF). Some will be striving to earn positions on ARDF Team USA for the next world championships, while others will be there just to have fun and learn all they can about this growing ham radio activity. Registration is now open for these championships. Members of the Backwoods Orienteering Klub (BOK) have been laying out courses, verifying maps and making other plans for a full week of radio-orienteering fun. The 2019 USA Championships are being combined with the biennial championships of International Amateur Radio Union (IARU) Region 2 (North and South America). Radio-orienteers from all parts of the country plus visitors from abroad are expected to attend. The schedule begins on Saturday, July 28 as the early participants arrive and check their equipment. Sunday will feature practice and training courses in foxhunting in the morning and sprint in the afternoon. An 80-meter practice/training course will be available on Monday, followed by a practice session of a special ARDF event for blind and low-signed individuals. Normal-sighted persons may participate by being blindfolded. On Tuesday morning will be a practice two-meter course. Wednesday will be a day of rest, sightseeing, and equipment check. This will be arrival day for those who do not participate in any practice sessions. A competitor meeting is planned for the evening. The first championship event, foxoring, will be on Thursday, August 1. Friday begins with the sprint championship, followed by the blind ARDF championships, a model event for equipment testing, and a competitor meeting. The two-meter classic event is on Saturday morning, followed by an awards banquet in the evening with medals for foxoring, sprint and two-meter classic. On Sunday morning is the 80-meter classic competition, followed immediately by awards presentation and departure in the afternoon. The competitive courses are open to anyone of any age, with or without an Amateur Radio license. Medals will be awarded in six age categories for males (M19 through M70) and five for females (W19 through W60), in accordance with IARU rules. Eligible winners of these championships will be under consideration for membership in ARDF Team USA, which will travel to Serbia for the 20th ARDF World Championships in September 2020. A maximum of three competitors in each age-gender category may be on a nation's team. An invitation has been issued to the students and coaches of Guangzhou No. 2 High School in China, who participated in the IARU Region 2 ARDF Championships in 2015 and 2017. If a sufficient number of young persons take part in these 2019 championships, awards will be presented in additional IARU categories for youth (M13, M15, W13 and W16). Information Bulletin 2 from the organizers has just been issued. It includes information about a special rate at the event hotel. A link to this bulletin, as well as to the online registration system, is in the event page of the BOK Web site. For the latest updates by e-mail and to interact with the organizers of these North Carolina championships, subscribe to a special group mailing list for participants and others interested in these championships by sending a blank e-mail to usa2019ardf-subscribe@yahoogroups.com. This article has been expanded and moved here. After almost seventeen years of service, Dale Hunt WB6BYU (at left) has stepped down as the ARDF Coordinator for Region 2 of the International Amateur Radio Union (IARU). Replacing him is Kenneth E. Harker WM5R (at right) of Austin, Texas, who was appointed by the Region 2 Executive Committee in August 2018. Dale Hunt was a long-time hidden transmitter hunting enthusiast when he and his wife Kuon KB7WRG helped to organize the 1991 Friendship Radiosport Games in Portland, Oregon, which included the first international ARDF event on USA soil. Eight years later, Dale and Kuon chaired the organizers of the first IARU Region 2 ARDF Championships near Portland. 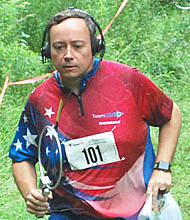 Dale has been a frequent medal winner at ARDF championships within Region 2 and was on ARDF Team USA to the World Championships on six occasions. Dale writes, "I want to thank all of you in the ARDF community for your support over the years that I have had the honor to serve as the R2 ARDF Coordinator. The sport has certainly grown since the first Championships in 1999, when 'Will I make it back out of the woods?' seemed more of a concern to some first-time ARDF competitors than how quickly they would find the transmitters. Dale continues, "Congratulations to Ken on his new role! I hope you will give him your continuing support and constructive ideas as he takes over. I expect he may make some changes -- it's good to get a fresh perspective periodically. Meanwhile, I'll still be around. A new job with longer hours and limited time off has slowed my ARDF projects down somewhat, but my toe has recovered from the Region 3 Championships in Mongolia and I hope to make it to more events. I'll continue to contribute to the community where I can. Besides, I have an 8-year-old granddaughter who is anxious to make it to the national championships." 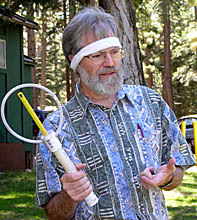 Ken Harker has been involved in ARDF since 2002. He has won medals at the USA ARDF Championships numerous times and was on ARDF Team USA to the ARDF World Championships in 2010, 2014, 2016 and 2018. He and his wife Jennifer W5JEN organized the USA ARDF Championships in 2008 and 2016. Ken writes, "I hope to live up to Dale's legacy and I look forward to working with everyone on ways we can grow and promote ARDF in Region 2." In addition to promoting the growth of ARDF within the region, Ken will represent the region and work with the ARDF Working Groups in IARU Regions 1 and 3 to refine ARDF rules and to plan international events. He has a personal ARDF Web page that includes his contact information. Continuing as national ARDF Coordinators in IARU Region 2 are Joe Moell KØOV (USA) and Joe Young VE7BFK (Canada). More about ARDF organization in the three IARU regions is here. 3rd World Youth ARDF Championships, June 30 - July 4, 2019 in Vinnytsia, Ukraine. 22nd IARU Region 1 ARDF Championships, September 2 - 8, 2019 in Rogla, Slovenia. 12th IARU Region 3 ARDF Championships, September 21 - 26, 2019 near Wixi City, China. 3rd IARU World ARDF Youth Championships, Summer 2020 in Slovenia. 20th IARU ARDF World Championships, September 2020 in Serbia. 4th IARU World ARDF Youth Championships, Summer 2021 in Romania. 23rd IARU Region 1 ARDF Championships, September 2021 in Razlog, Bulgaria. 5th IARU World ARDF Youth Championships, Summer 2022 in Poland. 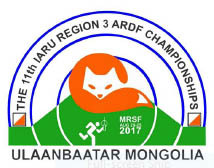 The Eleventh IARU Region 3 ARDF Championships took place August 20 - 25, 2017 near Ulaanbaatar, Mongolia, sponsored by the Mongolian Radio Sport Federation (MRSF). There were 109 official competitors from China, Japan, Korea, Mongolia and USA in Region 3. (USA is a member of Region 3 because of the USA territories that are located within the region.) There were also sixty open competitors, including six from Kazakhstan. They stayed at the Nairamdal International Children's Center. This was the first time that Mongolia has hosted the Region 3 ARDF Championships. Competitors were transported by bus to the two-meter classic competition. The eighty-meter classic event was close to the children's center. There was a cultural day between the two competitions, with an opportunity to visit the Chinggis Khagan Statue Complex and the Gandan Temple. Foxoring and sprint competitions were not provided. Representing USA were Dale Hunt WB6BYU, the IARU Region 2 ARDF Coordinator and Kuon Hunt KB7WRG. Here is their report. The first formal international-rules ARDF event in North America took place during the Second Friendship Radiosports Games in Portland back in 1991. Two years later, hams in Victoria, Canada hosted the Third Friendship Games, including that country's first radio-orienteering event. Those hams formed the nucleus of a group that continues to grow and promote ARDF throughout all of Canada. 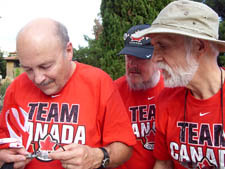 Joe Young VE7BFK, a participant in those 1993 games, is now the ARDF Coordinator for Radio Amateurs of Canada, the country's national Amateur Radio organization. In 2010, Canada sent a team to the ARDF World Championships for the first time. Team Canada participated in the Sixth IARU Region 2 ARDF Championships in Albuquerque, New Mexico during 2011. The ARDF in Canada Web site (www.ardf.ca) coordinates and announces ARDF events all over the country and provides all Canadian hams with information about the sport and about ARDF Team Canada. There is also another a Web site with a blog and announcements of ARDF events in British Columbia. The ARRL Fund for the Development of Amateur Radio Direction Finding is now accepting monetary donations to support deserving groups and individuals as they expand international-rules ARDF activities in the USA. No further contributions are anticipated from the original sources, so the fund has been opened to contributions from individuals and clubs. All contributions are tax deductible to the extent allowed by law and will be acknowledged by ARRL, a registered 501(c)(3) organization. Contributions may not be designated by donors to be granted to any specific recipient, individual or group. Grants from the fund may be requested by groups sponsoring ARDF events in the USA and by individuals who have qualified to represent the USA in ARDF competitions sanctioned by the ARRL or the International Amateur Radio Union (IARU). Requests for grants should be submitted electronically at least 60 days in advance of need to Mary Hobart K1MMH at ARRL Headquarters (mhobart@arrl.org). They will be reviewed by a committee that includes ARRL's Chief Executive Officer, Chief Development Officer and ARDF Coordinator. You can help support ARDF in the USA by sending a donation to ARDF Development Fund, c/o ARRL, 225 East Main Street, Newington, CT 06111. Checks should be made out to ARRL with "ARDF Development Fund" on the memo line. The not-for-profit American Radio Relay League (ARRL) is the national association of Amateur Radio operators, founded in 1914. ARRL is a member society of the IARU. Local ARDF sessions for training and practice are sometimes held in the areas listed below. If you are close to any of them, get involved! If you're not, the task of developing ARDF locally is yours. With the help of other hams in your town, it can be relatively easy and fun. This may be just the activity to shake the doldrums out of your club. Start planning now! Phoenix (AZ) area -- Get info from Byon Garrabrant N6BG. Los Angeles and Orange County (CA) area -- Get info here at this Homing In site. San Diego (CA) area -- Get info from Bill Elkerton W6ZM. San Francisco Bay (CA) area -- Get info from Bob Cooley KF6VSE. Santa Barbara (CA) area -- Get info from Marvin Johnston KE6HTS. Denver (CO) area -- Get info from Larry Benko WØQE. Boston (MA) area -- Get info at the Boston ARDF site. Baltimore (MD) area -- Get info from "Mac" McNeeley W3DQT. Bozeman (MT) area -- Get info from Harley Leach KI7XF. Portland (OR) area -- Get info from Dale Hunt WB6BYU. Raleigh/Durham (NC) area -- Get info at Piedmont Transmitter Tracking site. Albuquerque (NM) area -- Get info at Albuquerque Transmitter Hunters site. Nashville (TN) area -- Get info at the Williamson County ARES site. Austin and Houston (TX) area -- Get info at the Texas ARDF site. Port Angeles (WA) area -- Get info from Neil Robin WA7NBF. Seattle/Tacoma (WA) area -- Get info from Art Jury KF7GD. Milwaukee (WI) area -- Get info from Paul Gruettner WB9ODQ. Victoria (BC Canada) area -- Get info from Joe Young VE7BFK. Current SoCal sessions -- Southern California practice/demonstration events of 2018-2019. SoCal 2017 -- Southern California practice/demonstration events of 2017, including Hillcrest Park, Lindo Lake Park, Mt. Pinos, Cal Poly San Luis Obispo and Bonelli Regional Park. SoCal 2016 -- Southern California (and Arizona) practice/demonstration events of 2016, including Hillcrest Park, Cal Poly San Luis Obispo, Griffith Park, Lake Murray, Mt. Pinos, Kenneth Hahn State Recreation Area, Lake Los Carneros (2), Schabarum Regional Park and Bonelli Regional Park (2). SoCal 2015 -- Southern California practice/demonstration events of 2015, including Lake Los Carneros, El Dorado Park, Angel's Gate Park, Mt. Laguna, Hillcrest Park, Cal Poly San Luis Obispo, Bonelli Regional Park, Vasquez Rocks State Park and Schabarum Regional Park. SoCal 2014 -- Southern California practice/demonstration events of 2014, including Bonelli Regional Park, Topanga State Park (2), Tri-City Park, Schabarum Regional Park, Mt. Pinos (2), Santa Fe Dam Recreational Area, Cal Poly San Luis Obispo and Lake Los Carneros. SoCal 2013 -- Southern California practice/demonstration events of 2013, including Tri-City Park, Lake Los Carneros (4), Mt. Pinos (2), Santa Fe Dam, Schabarum Regional Park, Cal Poly San Luis Obispo and Bonelli Regional Park. June 13 - 17, 2018 -- Eighteenth USA ARDF Championships near Truckee, CA. July 31 - August 6, 2017 -- Seventeenth USA and Ninth IARU Region 2 ARDF Championships near Cincinnati, OH. April 6 - 10, 2016 -- Sixteenth USA ARDF Championships near Killeen, TX. August 27-30, 2015 -- Fifteenth USA and Eighth IARU Region 2 ARDF Championships near Elbert, CO.
June 5 - 8, 2014 -- Fourteenth USA ARDF Championships near Boston, MA. October 9 - 13, 2013 -- Thirteenth and Seventh IARU Region 2 ARDF Championships near Asheboro, NC.